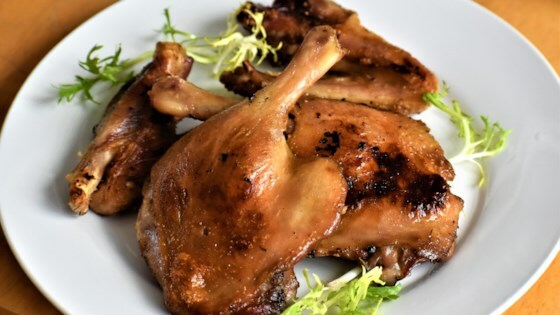 "Duck confit takes a while to prepare properly but is well worth the effort. This melt-in-your mouth duck treat will become a favorite. I buy whole ducks and then remove legs/wings whole and breasts from the bone. Always keep the skin on duck! You can easily double this recipe if you're having a dinner party. I learned this method from Chef Uriah of the Columbian Cafe of Astoria, Oregon. The breasts become pan roasted Muscovy duck (see my recipe) and the legs/wings become confit. Never roast a Muscovy duck whole: the breast comes out dry, musky, and bitter tasting." Combine shallot, sugar, salt, pepper, garlic, and thyme in a small bowl. Rub all over duck legs, thighs, and wings. Arrange duck parts skin side-up in a dish and cover with plastic wrap. Refrigerate until the seasoning is well absorbed, 24 to 48 hours. Rinse off the seasoning and pat the duck dry. Arrange duck in a single layer in a 9x13-inch baking pan. Let duck stand until it reaches room temperature, about 30 minutes. Melt duck fat in a saucepan over medium heat until bubbles begin to form, 6 to 8 minutes. Pour duck fat over the room-temperature duck. Bake duck in the preheated oven until tender and the juices run clear, 2 to 3 hours. An instant-read thermometer inserted near the bone should read 135 degrees F (57 degrees C). Pour off the duck fat. Brush a grill pan with some of the used duck fat and heat over medium-high heat until smoking. Add baked duck; cook in batches until skin is crispy, about 90 seconds per side. Learn how to make a dish served with orange-spiced leek and sweet-potato puree. Regular white sugar can be substituted for the cane sugar. If not serving right away, let duck cool completely after baking and store in its cooking fat. Fish it out of the fat and gently warm the duck in a pan prior to crisping the skin. Never serve wobbly-skinned confit; the crispy duck skin makes the dish absolute heaven! You can substitute the grill pan with a stainless or cast iron pan, but not a nonstick pan. Nutrition data for this recipe includes the full amount of duck fat. The actual amount of duck fat consumed will vary.